This is new print of a photograph taken in 1970. 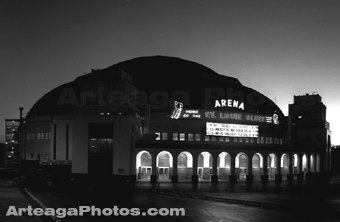 This photograph was taken by our founder Bob Arteaga (1903-1982). Commissioned by Sid Solomon the owner of the St. Louis Blues in 1970. The detail in this photograph is outstanding. The marquee is easily readable on the photograph. $50.00 plus $7.50 shipping in the contiguous 48 states. Sales tax will be added for Missouri residents. To order call us at 314 352-8345. Our Guarantee: If you are not completely satisfied with this photograph. Return it in good condition within 15 days of receipt for a refund of $54. We have not had a return on this photograph. Notice: All photography is protected by digital watermarks and copyright laws. 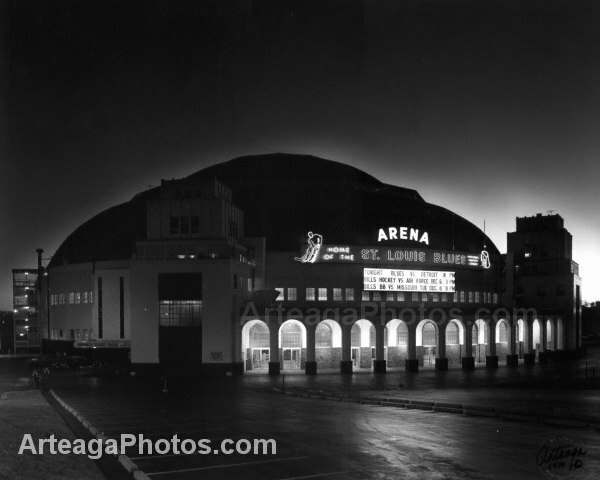 All photography of St. Louis is © Arteaga Photos LTD. and may not be reproduced in any form without expressed written permission. All rights reserved.